Giraffe: Come in! Come on in, children! 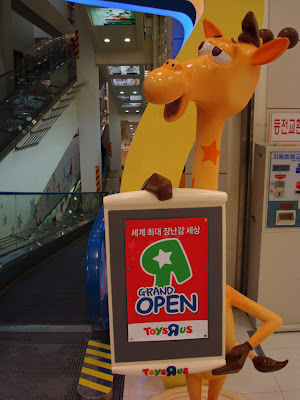 Come on into the first Toys R Us in Korea! 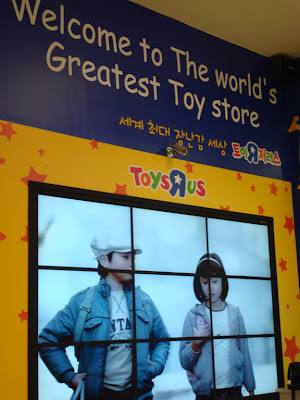 The biggest toy store ever in ALL of Korea! Jae Woo: Hey, what's wrong Mi Ra? Mi Ra: I don't know about this new Toys R Us. Jae Woo: What do you mean? Mi Ra: Well, I wonder if it really is the world's greatest toy store. Jae Woo: Of course it is! It's huge! Mi Ra: I know. I know. But I think it's kind of weird that it's almost completely full of stuff from Japan and the United States. Jae Woo: What's weird about that? Mi Ra: We live in Korea, remember? Jae Woo: Oh come on! They they have tons of Pororo stuff. Everybody loves Pororo! Mi Ra: I know. They have a ton of Pororo stuff. But other than that little penguin, everything else is from other countries it seems like. Don't you worry about our culture, Jae Woo? Jae Woo: Worry about our culture? Ha! No way! Mi Ra: Well, don't you wish we had more of our own toys? And our own cartoons? Jae Woo: I don't know. If you want your own cartoons so much, why don't you just tell your uncle to make them. He's an animator, isn't he? Mi Ra: Tell my uncle! Are you crazy? He spends six days a week animating for other countries. Actually, he makes the animation that they base all these toys off of and then sell back to us at high prices. He doesn't have the time or money to worry about creating his own thing! Jae Woo: Oh, lighten up! If it's so bad in animation, he should just go work in real estate then. Mi Ra: Okay, okay. I won't complain about our lack of original content. Still, doesn't something seem awfully suspicious about that giraffe mascot? Mi Ra & Jae Woo: Definitely! Giraffe: Hey everybody! We've been open since December 8th and like to stay open for a loooooong time! 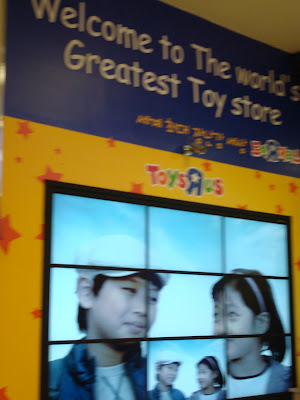 So don't go to those small little toy stores everywhere else, come to Toys R Us located in Lotte Mart! It's conveniently located next to the Guil subway station in Seoul. Don't get me wrong. I'm not bitter! In fact, I LOVE Toys R Us! That doesn't mean I cannot question the long term benefit of allowing such a big store into Korea. 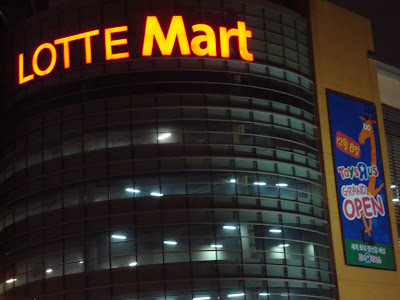 Remember, it's the BIGGEST toy store in all of Korea. Korea traditionally doesn't have toy stores, but little stationery/toy shops all over the place. Modern day Toys R Us is much different than the Toys R Us of your youth. I was shocked that there were so few toys originally created to be just toys. Rather, almost EVERYTHING was based off licensed characters from the United States and Japan (and Germany had some influence in the board games department). Pororo seemed to be the only dominant Korean property. It all boggled my mind! And that giraffe was just crazy! That seems to be a growing trend with toys in the US, too. I went to a Target store a couple months back to find props for my Halloween costume, and all the toys in the toy departments were either officially licensed, electronic, or more often than not, both. There were hardly any simple toys at all, and hardly anything that didn't light up or make noise. Even Legos are following this trend. I fear that this next generation of children all over the world will grow up never having to develop a sense of imagination because even their play is pre-set, every toy is from a world somebody else created and then sold to them, and that they'll never feel the need to create worlds all on their own anymore. Wow, I didnt know that Korea does animation primarily for other countries. From all of your pictures of pigs, penguins, chickens, robots, and other characters giving the thumbs up, it seems Korea has plenty of their own animation set up all over the country. Hey, Trojan Trumpet. Cartoon culture is alive and well in Korea! Especially when it comes to restaurant trade characters, ha ha! There are lots of Korean made characters here, however, Japanese and U.S. characters still do dominate. Can you by chance take a picture of all the Pororo goods in that store? 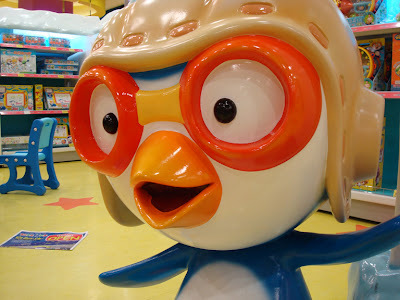 I love Pororo. But online they don't seem to have that many goods. That being said, I loved a Korean Character named Gomugomu. He's made by Aurora in Korea. 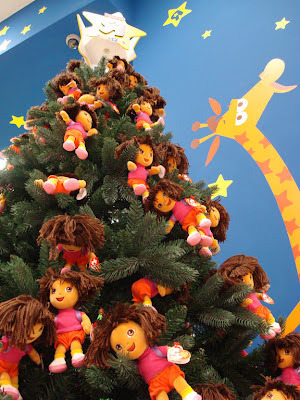 However, if you look at the Aurora website, they have more dolls/stuffed animals geared towards an American audience. Chiigua, thanks for visiting this blog! 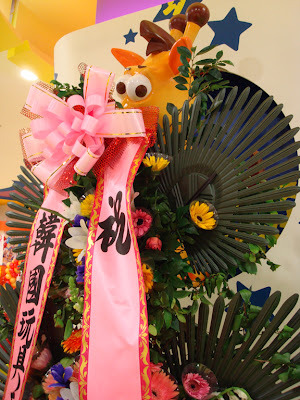 Actually, I was only able to take a picture of that first Pororo before the Toys R Us staff made me quit, ha ha! Aurora makes some good products here in Korea that I've seen at places like ArtBox. Thanks for the Gomugomu link! I didn't know about that character before and it's always good to learn about homegrown Korean content. The Simpsons as an example of service animation, animation that is produced in Korea mainly for other markets (such as the U.S., Japan, Canda, France, etc. ).